Okay, this isn't technically an outfit post, per say, but it is what I wore today. 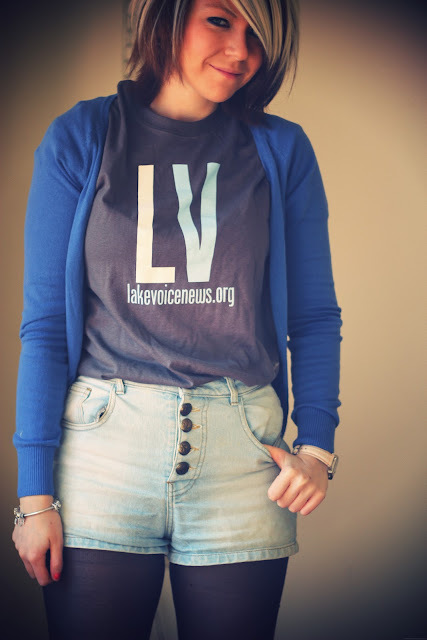 Lake Voice is an online publication that we're running in my Editing II Journalism class. We completely design, run, edit and write the publication. I have a great group of colleagues at Lake Voice and I'm really proud of everything we've achieved this semester so far. My official role in Lake Voice is of Ombudsman- I am in charge of all emails, comments, questions, submissions etc. but I am also involved in writing about the experiences in the Newsroom, editing and of course, writing. Today was my last story submission for the semester, but I've been really happy with the stories I've produced this semester. When I first starting in this class I was a very nervous journalist. I knew I could write, but my ability to interview needed improvement and interviewing generally made me nervous. I definitely feel much more confident in my abilities now and am really proud of the stories I've written and the feedback I've received on them. While Lake Voice is based in Duluth, we hope our stories are relevant to the wider world too, so I'd really love you to check it out and see what we do over there!! The stories I've written for the publication are here but you should pop along anyway and see what we do!! Also, I love your shorts !